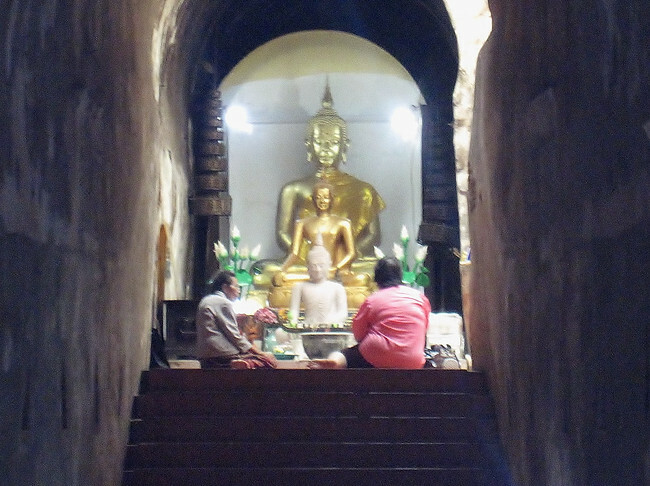 A Little Thought...Showing Respect in Asian Culture - a little adrift jr.
Women pray silently to Buddha inside of Wat Umong. Have you ever seen somebody holding their hands together like they’re about to pray and then bow? Well, that’s called a wai and it’s to show respect toward the people around you. For example, say a monk (the bald men with beautiful orange or red robes on) is on a daily stroll and is walking towards you and you need to show respect, what do you do? 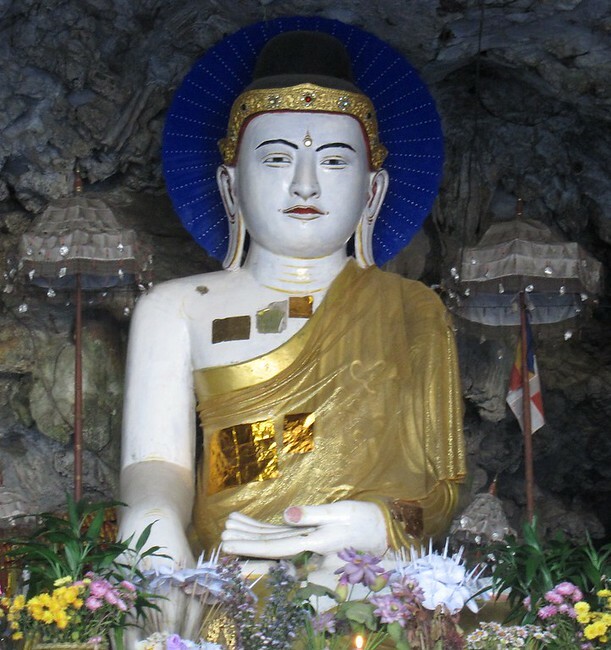 A Buddha sits inside of a cave in Hpa'an. You wai the monk by putting your hands in a praying position between your eyebrows and bow so that your body is at a 90 degree angle. This is just one way to show respect toward other people, including holy monks. But, the wai you have to do is different depending on the person’s status or age. What I mean is, you put your praying hands against different places on your body depending on the person’s status. Your chest is the lowest place, and between your eyebrows being the highest. You don’t only wai monks though, you can wai the cashier at a grocery store if they wai you first (and you’re a kid), your teacher, you can even wai your own grandparents. 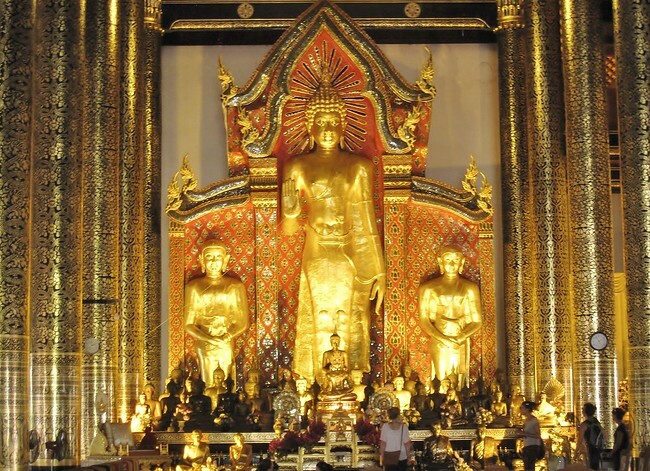 Tourists interested in the humongous Buddha inside of the temple Chedi Luang, Chiang Mai. Another way people in SEA show respect toward each other is by serving the oldest person at the table first. So, if there are two kids at the table with their mom and grandma, the grandma gets served first! This is true even if she ordered a meal with the most food, or the kid’s meal is sooner, the grandma has to at least get her rice served first. The order would go from grandma, mom, and then the two kids. There are other ways that people show respect, but these are the two major ways that I saw everywhere in SEA when I looked close enough at everything around me. Before coming to SEA, I thought respect meant something different. I thought it meant minding your elders, being nice to other people and mostly just listening when somebody is talking to you. But after going to Southeast Asia, it showed me that there is more to respect than holding the door for somebody or carrying their groceries. I mean, I’m not saying that isn’t showing respect, but I feel like Asians show more respect in their daily lives than Americans. 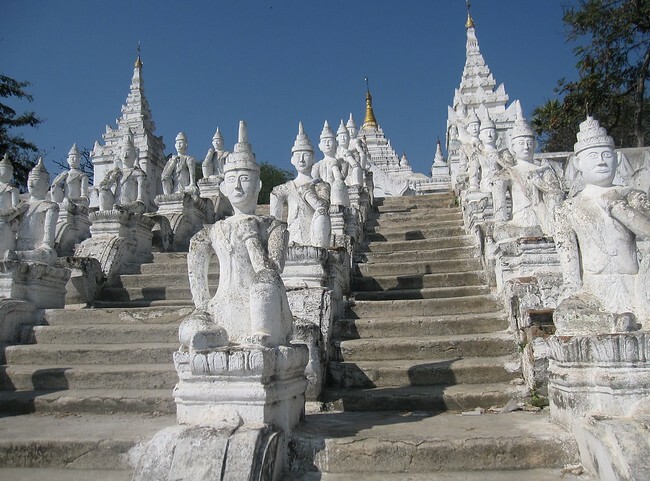 Nats protecting a temple in Mingun, near Mandalay. Being in the United States again, I am trying to bring some of Asia’s respect culture back here with me, perhaps by giving the silverware that was handed to me first to my grandmother at the dinner table because she is older than me, and things like that. Now, I don’t think will wai to her though, that would just be awkward and I don’t think she would even know what I was doing! Asia and the United States definitely have some different ways to show respect, but either way, I’m glad everywhere I go I can see a respectful attitude among the people because with it, it makes a very nice world. 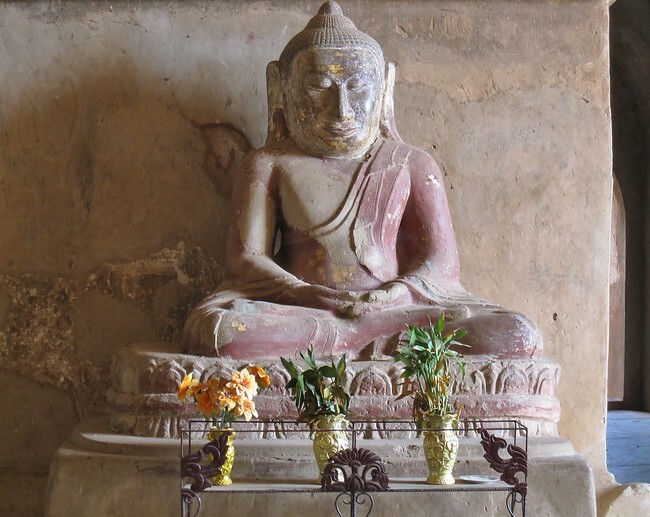 A statue of Buddha that has been paid a lot of respect in the ancient temples of Bagan. I know what you mean about wai-ing to people or showing Asian respect to people in the west & they don’t understand! I have the hardest time breaking the habit of handing things to people with 2 hands like in Korea and Myanmar, and people in the US don’t understand and just think I’m crazy! I also really agree with you that we should show more respect ot our elders and I hope I can bring it home with me too! Yeah, my Aunt Shannon is so used to showing respect to people in Asia, she always hands me things with two hands! I feel like respect is something that has slowly slipped out of the US which is sad because when I got to the airport in Georgia, I noticed how rude the people in America were because I had been in Asia for so long. It is so wonderful to read this post from you. Well done. Please do keep those ways of respecting others around you (family, friends and strangers) throughout your life, no matter where you go. Let it be part of who you are regardless of how strange others may perceive you because there’s so much room and opportunities to explain and educate why you do it, why it is important. I agree that these behaviors do make for a better world. Good job!!! This is great! I read it and then found out the author is only 11yrs old…which made it awesome. You are spot on in saying that there needs to be more respect shown. My mother told me that in Vietnam, student bow to their professor. Thank you so much! I try to not sound too kiddish while writing but still have all of my personality in it. Yeah, I remember when I was in Thailand there would always be random people with different rankings bowing to each other and always wondered why they did that until I found out it’s to show the other person respect. That’s so interesting, did you learn Chinese and speak it? I took a Thai class and learned a little of the language but never finished it. I’m glad I was able to inspire you to write something about this important topic!